In my dream world, I’ve got an unlimited budget to decorate and then continually redecorate our home as our tastes and style evolve. Ahh, wouldn’t that be amazing? Since that’s clearly a dream, I’m getting better and better and achieving the look I want without breaking the bank. I don’t know about you, but it seems like months when money is tightest are the months I’m seriously craving change. I am a HUGE advocate of creating a home that you love and that really reflects you. BUT, slightly more important are those boring things like retirement and health insurance that have to be funded before money gets spent on the house. In the true spirit of living A Prudent Life, I thought I’d do a series on the Secrets of Low Budget, High Style. The series will show you all the ways I work on a low budget so that I can enjoy the occasional splurge without sacrificing our future. 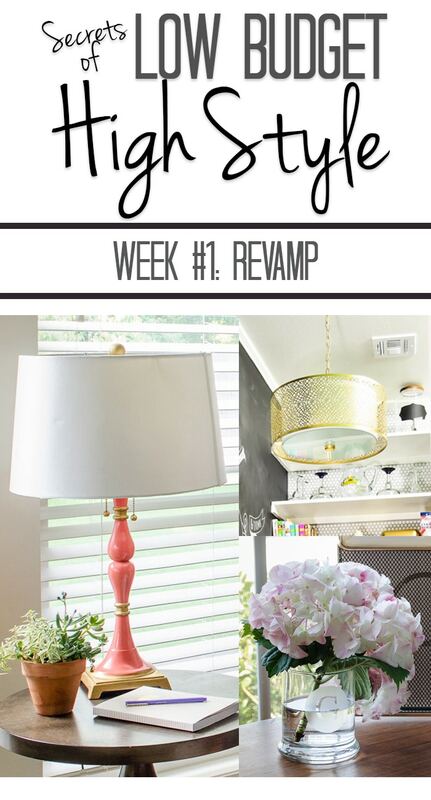 Week #1 is all about revamping, which is updating an item to better reflect your current style. These projects are my favorite ways to save and can be adjusted to work with any decor! Something I have to remind myself is that I can update brand new item. 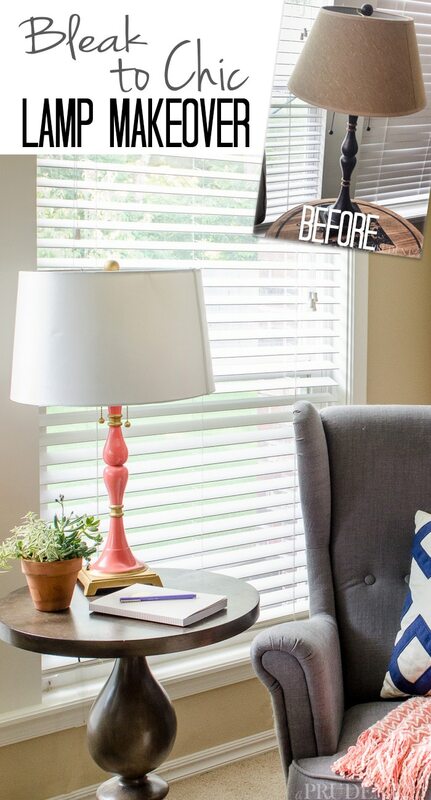 When my DIY light fixture wasn’t coming together exactly like I planned during the pantry makeover, I needed an alternative FAST before the One Room Challenge deadline. I didn’t have time for extensive research, and we hadn’t budgeted much for new lighting because of my DIY plan. I found a really cool light fixture at the hardware store, but it was chrome. 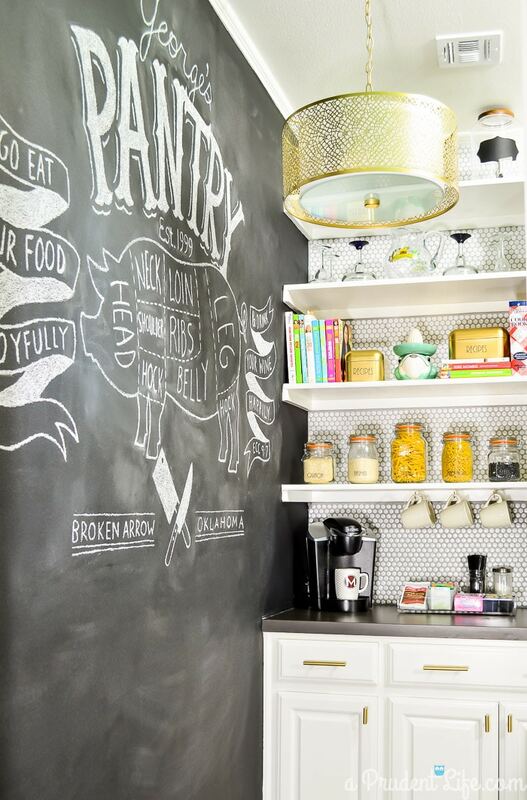 A can of spray paint later, the revamped fixture was perfect for the pantry! It looks like it cost way more than the $99 price tag (the price is now $109). Angela from Blue i Style also uses this tip to update items for her home. 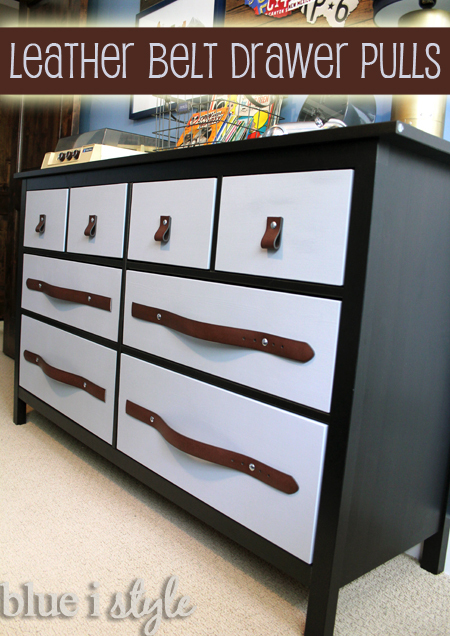 In her son’s bedroom, she used paint and amazing DIY leather drawer pulls to transform an IKEA HEMNES dresser. Now it looks like a high-end custom dresser instead of something you buy after eating Swedish meatballs. When your style evolves faster than your bank account is growing, one of your best options is to transform items you already own. We had a nice lamp that I LOVED when it was in my office a few years ago. But I had grown to be really annoyed that it was just adding another layer of beige to the living room. Instead of hauling it to the garage sale pile in the attic, I gave it a new personality. 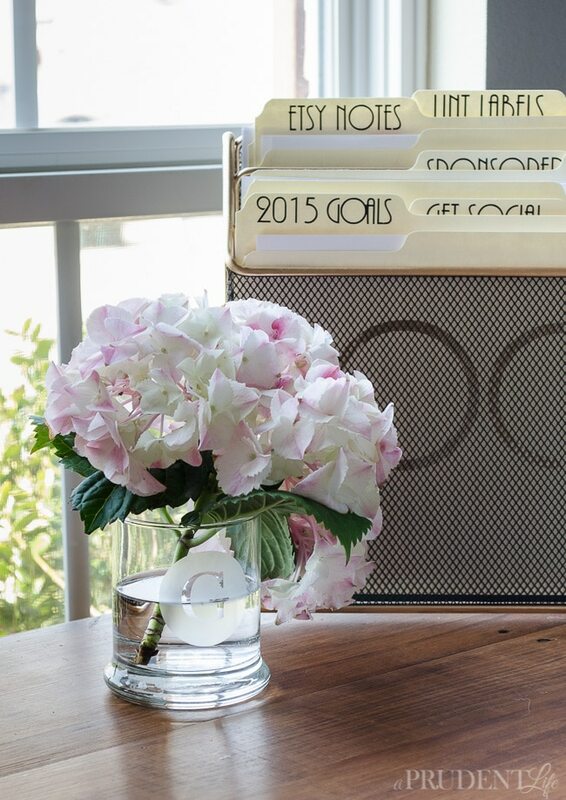 This tip is also perfect for sentimental items that don’t work in your home. Corey from TinySidekick had a cabinet from her grandmother that brought her great memories, but didn’t match the fresh feel of her decor. A couple projects later, Corey has an amazing bar cabinet that saved her from buying a new piece of furniture AND keeps the memories. Make sure you click over to see the inside! Tip #3: Hello, Dollar Tree! If you’re like me, Dollar Tree doesn’t even register in your mind as somewhere to go when you need new decor. Yet, an occasional trip through all their aisles can lead to some creative ideas. They have the best $1 glass vases, which can be updated to fit any design style. Adding a monogram with etching cream is a quick way to elevate a plain vase into something chic and boutique-worthy. Plain office supplies are also a steal at Dollar Tree. 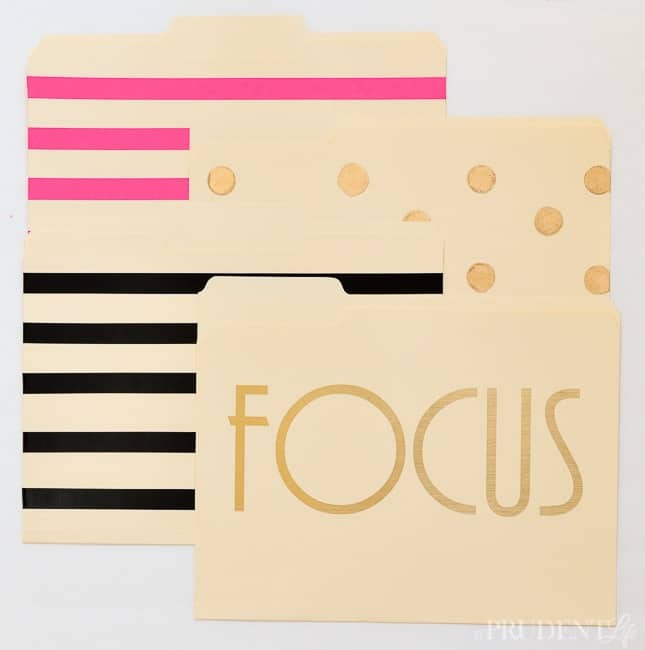 I’m always lusting after gorgeous and pricey file folders (I’m weird, I know). When it was time to organize my desk, I avoided the temptation to splurge and made my own pretty folders. The black stripe folder was made with electrical tape, which was also from Dollar Tree. That one should be called from double cheap to double chic! Anyone else read that in the voice of Gordon Gekko…Greed is Good? No? Just me? Pretty much any time I paint something, I’m shocked at the transforming power it has. You saw it above in almost every example. Spray paint is my absolute favorite because it’s fast and affordable. I’m also a sucker for the instant gratification you get when spray painting. There are some other alternatives that also come in handy though. Back in the very early days of the blog, I updated the craft room. 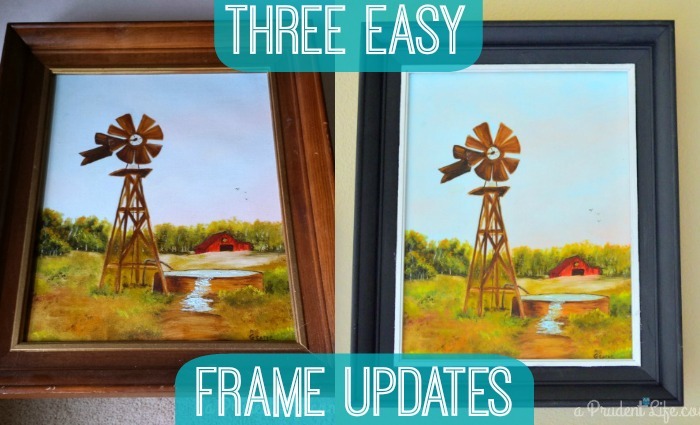 I had a bunch of artwork that my husband’s grandma had painted, so it had big sentimental value, but the frames didn’t match the room design. I ended up transforming them with basic craft paint…you know, the kind you can get for $0.99! Rub ‘n Buff is another gem for your revamping arsenal. It transforms like paint, but with a legit metallic look. It’s the texture of toothpaste, and you just rub it on to a surface with your finger for total transformation. The trash can below was another of my first blogging projects. I used Rub ‘n Buff on the rim and base and I don’t think anyone would know this used to be a silver bin from the Target Dollar Spot. So next time you’re in a funk because your home isn’t being decorated as fast as you’d like, think about what you could revamp to stay in budget while still satisfying your urge for updates! Ready for the next lessons? « Modern Office for Two – 3D Design Plans! Yeah! 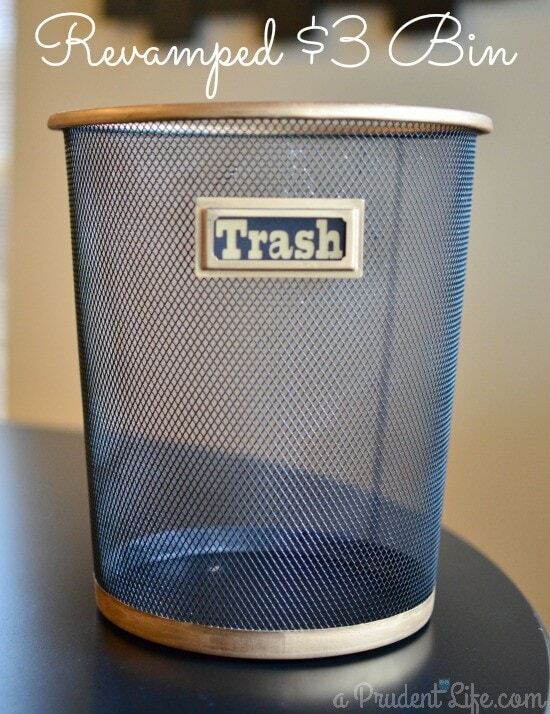 So glad you enjoyed the post and my super cheap trash can! I get so excited when I can revamp something that inexpensively. What a great roundup of projects! They all turned out so great. Love that gold light! Oh my gosh I am laughing so hard at the meatballs comment! These are great befores and afters. Thanks Tiffany! I’m so glad someone else laughed. I kind of forgot I had typed it and might have laughed out loud at myself when I was proofreading… I probably shouldn’t admit that! YES! I’m so glad we think alike. The more I save, the more other fun stuff I can do. ? Thanks so much for commenting and letting me know you like the series! Thank you!!! So glad you are enjoying the series – the next one should be fun too. It’s all the things I should never have purchased and why they were mistakes!